Elevate your water balloon warfare to new heights with the Tie-Not Battle Pump by Kaos. This portable pumping station features the Tie-Not Tying Tool, which makes it easy for kids to fill and tie water balloons in seconds. Operation is simple: attach a balloon to the perfectly-sized nozzle, press the pump a few times, wrap the filled balloon around the Tie-Not tool, slip the end through the notch, and pull off a perfectly tied balloon. Integrated handle makes it a piece of cake to take your water warfare anywhere. One gallon capacity makes approximately 20 balloons per filling. 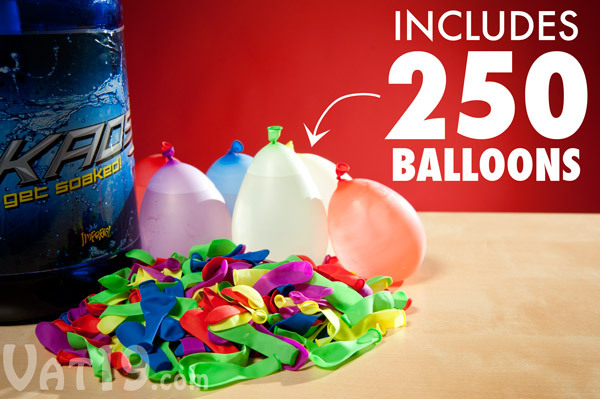 Includes 250 water balloons. The Battle Pump is available in several color combinations (our choice). The Battle Pump received a cosmetic make-over after this video was produced. It is no longer available in the gray and blue colors shown in the video. This change is cosmetic only. The Battle Pump's functionality has remained unchanged. 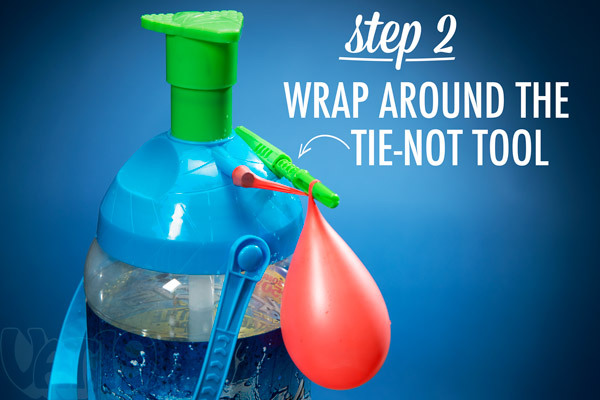 Make water balloons in under 10 seconds. Anywhere! We love water balloon fights. But before we stumbled across the Tie-Not Water Balloon Filler and Tying Tool, creating ammunition was always a chore. However, the only problem (as teeny tiny as it is) with the Tie-Not Filler is that it isn't 100% portable. It must be attached to a hose. Enter the Tie-Not Battle Pump by Kaos. 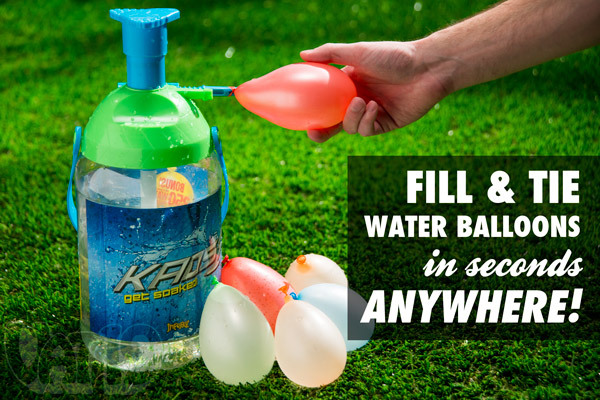 This sucker is the perfect addition to your water balloon arsenal. The one-gallon canister features a pump, nozzle, and a built-in Tie-Not Tying Tool. So, no matter where you are, you can quickly create more water grenades! Create water balloons quickly (and nearly anywhere!) with the Tie-Not Battle Pump. Looking for the Regular Tie-Not? It features the same quick-tying technology, but screws directly into any standard size garden hose. 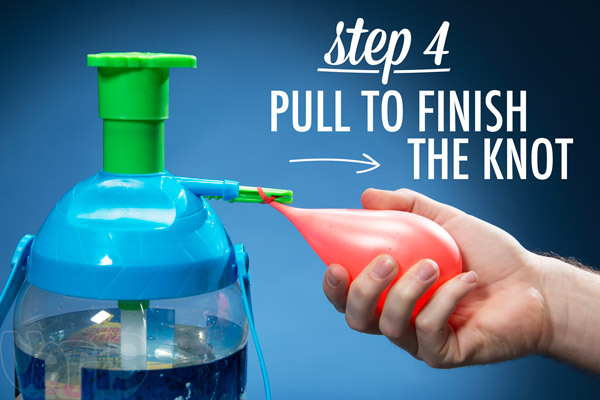 Fill and tie water balloons in less than 6 seconds! Watch how easy it is to create water balloons! Check out the short video clip below to see how quick and easy it is to fill and tie water balloons with the Tie-Not Battle Pump. Note: The Battle Pump is no longer available in the color shown in the video below. However, the functionality of the unit has not changed. It's just brighter, prettier colors! 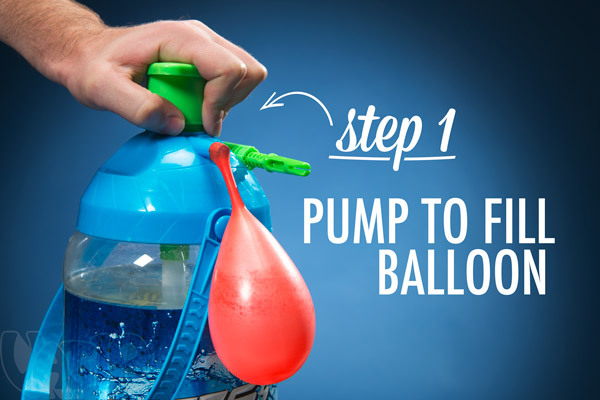 Attach a balloon to the end of the nozzle and fill it using the pump on the top of the unit. Simply press the pump to fill your water bomb. Once your balloon is the desired size, flip the end around the Tie-Not Tying Tool. 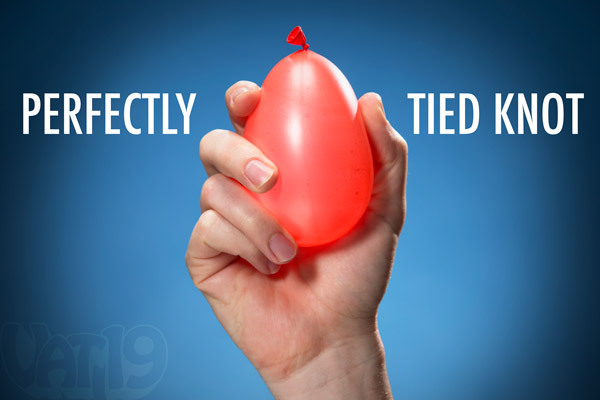 Flip your balloon around the Tie-Not to initiate the tying process. Detach the end of the balloon from the nozzle and thread it through the end of the Tie-Not. It will rest in a notch on the underside of the tying tool. You're almost done making the balloon! It's essential to thread the end of the balloon through the tip of the Tie-Not Tying Tool. Simply tug the balloon off the Tie-Not Tying Tool and it will automatically tie itself. Amazing, right? Simply draw the balloon off the end of the Tie-Not Tying Tool to finish tying it. Creates perfect water projectiles in seconds! The Tie-Not Tying Tool is pure genius. 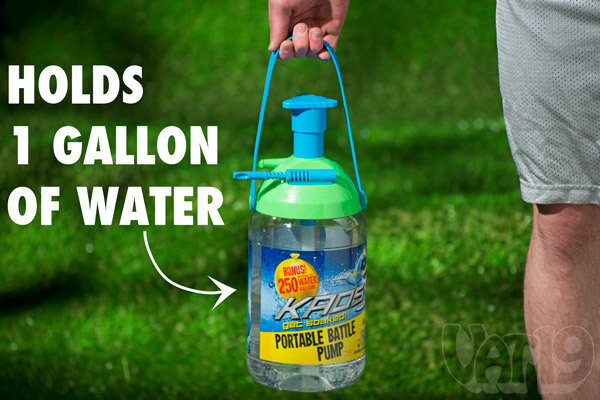 Combining it with an easy-to-use pump and portable one-gallon jug makes it pure awesome. With the Tie-Not Battle Pump, you can create flawless water balloons in seconds, anywhere the battle rages. 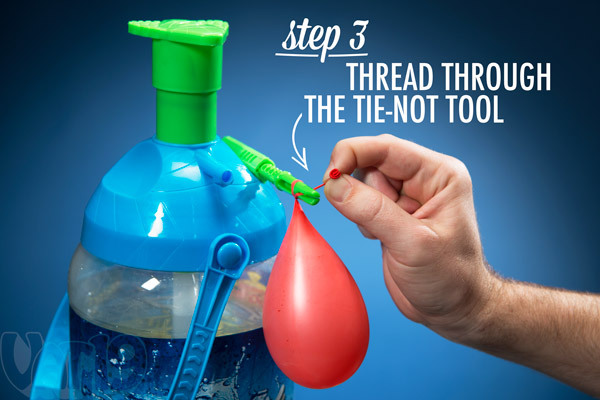 The Tie-Not Tying Tool makes tying water balloons effortless. 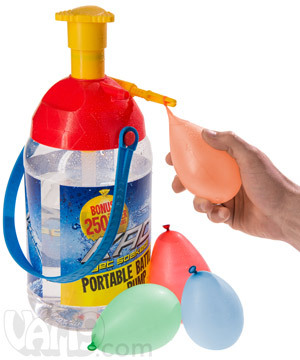 The Tie-Not Battle Pump holds one gallon (3.79 liters) of water, enough to fill 15-20 average-size water balloons. At a mere 9 pounds when completely full, the Battle Pump is easy to carry. The handle makes it easy to bring your Battle Pump to wherever there's action. Comes with enough ammo to start a war! The Tie-Not Battle Pump includes 250 water balloons. This should ensure a healthy start to your next water war. The Tie-Not Battle Pump comes equipped with 250 water balloons. Question: How is this different than the regular Tie-Not? Answer: The Tie-Not Water Balloon Filler and Tying Tool must be attached to a hose. The Tie-Not Battle Pump is portable and doesn't require a hose. Simply fill it up from a faucet and you're ready to go! Question: Should I buy this or the regular Tie-Not? Answer: This is like asking if you should have a navy or an air force. You need both, son! The Tie-Not Water Balloon Filler and Tying Tool hooks up to a garden hose for constant ammo creation. However, your position is fixed — and thus vulnerable to attack. The Battle Pump, on the other hand, is highly portable. You can sneak behind enemy lines, create ammo, and drench the opposition. Think of it another way (which also allows for a cross-promo): The Battle Pump is like a B-2 Stealth Bomber whereas the regular Tie-Not is like an aircraft carrier. Question: How many balloons can I make from one fill-up of the Battle Pump? 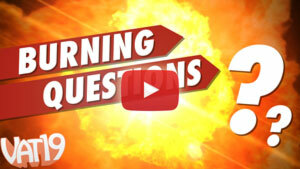 Answer: You can make approximately 20 average-size water balloons. The Battle Pump has a capacity of one gallon (128 ounces). Your typical water balloon holds 5-6 ounces of water. Question: Can I choose my color of Battle Pump? Answer: No. The Battle Pump was originally available only in a blue & gray combo (as shown in our video). That color scheme has been replaced by a series of brighter (and in our opinion, better looking) color combos. The color combinations are random. However, they all look good! Plus, it's their function (quickly making water balloons) which is most important! So, don't sweat the color. We'll send you a perfectly beautiful one! Question: Aren't you going to show someone getting pummeled in the face with a water balloon? You bet your sweet freedom we will! Nothing better than hitting the boss in the face.